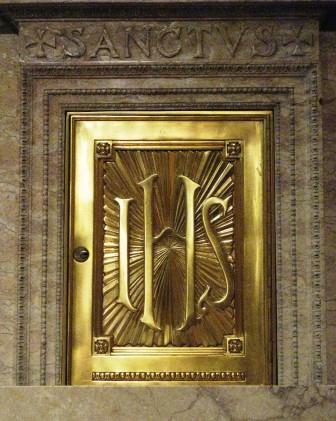 A recent inclusion to the Universal Calendar of the Roman Catholic Church is the optional memorial of the Most Holy Name of Jesus on January 3. 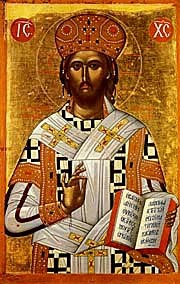 In Saint Paul’s Letter to the Philippians, we read that the name of Jesus is above every other name, and that at this name every knee should bend and every tongue confess that Jesus is Lord (see Philippians 2:8-11). which is an abbreviation of the spelling of Jesus’ name in the Greek language. It is common to find this monogram somewhere in a church. Jesus’ name was also added to the “Hail Mary” prayer. Let children draw and decorate a poster with the IHS monogram on it. Talk about what this monogram means. Mary Corbet's "Needle'n Thread" Embroidery Site has a free embroidery pattern for the IHS symbol with grapes and wheat. You could print out this pattern and use it as a coloring page for children. 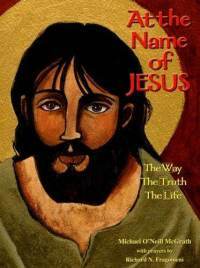 There is a lovely book, “At the Name of Jesus: The Way, The Truth, The Life,” by the artist Michael O’Neill McGrath, with prayers by Richard N. Fragomeni. Published by World Library Publications (ISBN 978-1-58459-314-0), this colorful and lavishly illustrated book is a wonderful book for reflection. The book includes twenty images, accompanied by stories and prayers. The video below, "God Saves," from the Apostleship of Prayer gives a good explanation of Jesus' holy name. On this feast of the Most Holy Name of Jesus, spend some time in prayer reflecting on Jesus’ name. Read Philippians 2:1-11. During this Christmas Season, and throughout the year, how can we more deeply adopt this attitude of Jesus? Pray the Litany of the Holy Name of Jesus. Sing the hymn, “All Praise to Jesus’ Hallowed Name.” You can download the score to this hymn here.